Ah yes, how can I forget that summer. It all started with a reference from a good client who was a long time member of the local bridge club. of conversation during many of their bridge games. 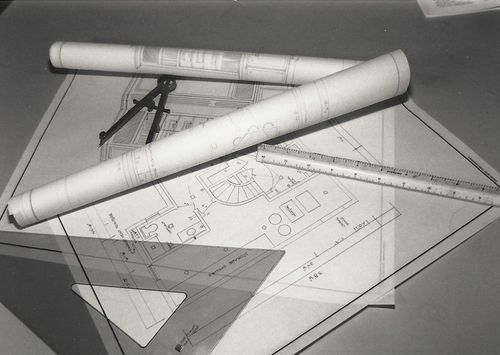 It’s a remodeling contractor’s dream…. all the ladies talking about you and bringing you more work. her large basement into a multi purpose recreation space. a computer desk with bookcases, an octagon bedroom with a large closet and a half bath – no pics. 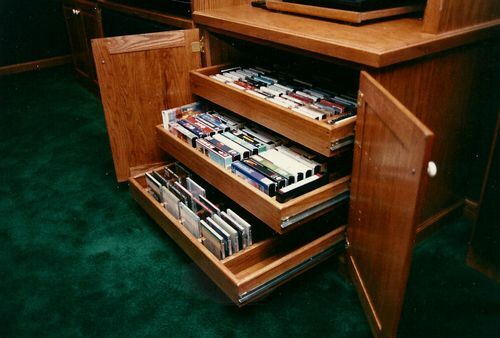 VCR and cassette tapes!..... remember those? This was back in the days of rear projection TVs…. TG those days are gone. 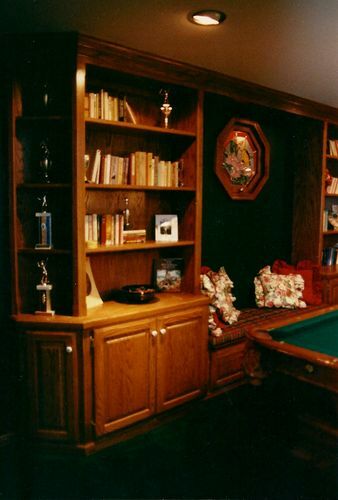 A pool table area with a built in bench/ book case. The octagon stained glass window had a light in it to simulate natural light. and a full bar with a popcorn machine and a built in wine rack. But here’s the rub. We weren’t planning to do this much work when we signed the contract. All of the cabinetry was added – one at a time – as a change order. No big deal, right? ..... We always have change orders. Well, you see there’s more to it than that. 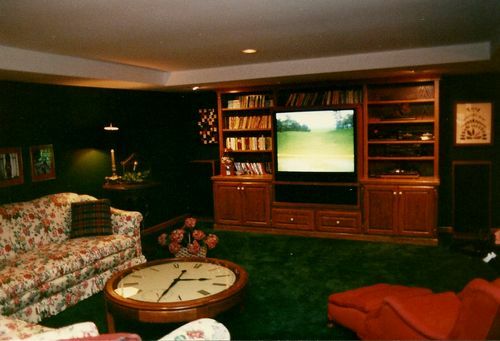 Her identical basement needed to be remodeled into a recreation room too. I was like the new found gay hair dresser they all wanted to do their hair! ....Ha! So, These two lovely ladies came up with a plan that in the beginning seemed like a good idea. The plan was to bundle BOTH BASEMENT REMODELS AT THE SAME TIME, but 2 weeks apart. I think they said they read about it in Happy Homeowner’s Running Amok magazine. They figured I could frame one basement and, while the electrical and drywall was being installed by the sub contractors, I could walk across the street and start framing the other basement. FOR A DISCOUNT ...... reminds me of cheap Frank on American Pickers, hmmmmm. Very tricky ladies. But it seemed like a win win, they were pretty charming (rich).....Sure, Lets do it. Man, my ears were burning that month! The bridge club ladies were talking about their joint venture like they’d figured out a way to get everything they ever wanted….. for half price! But, you know how it is, nothing ever goes as planned and usually snowballs while trying to finish on time. It turned into a competition to see who would have the best basement remodel! She added a built in wine rack under the stairs. It was supposed to be a simple closet….. No problem. The other lady added a wine rack with a fridge, .... with ice. 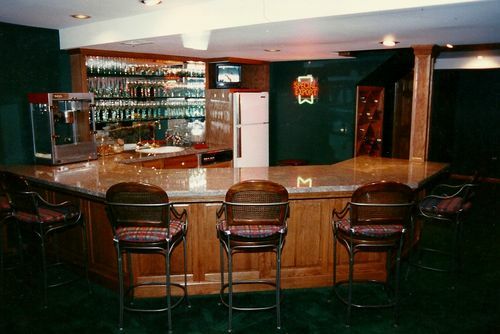 She added the entertainment center and wrap around wet bar with a full kitchen…. big job. 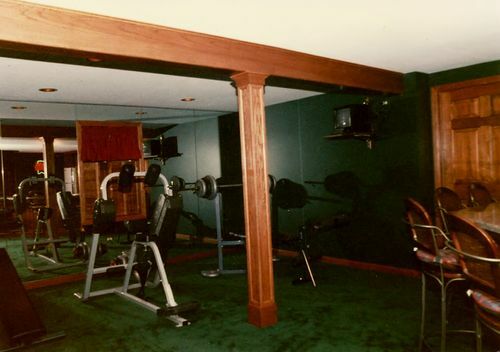 The other lady added an entertainment center and a weight room….. here we go. She added a half bath which meant busting up the concrete and installing an ejector pump…. huge project. 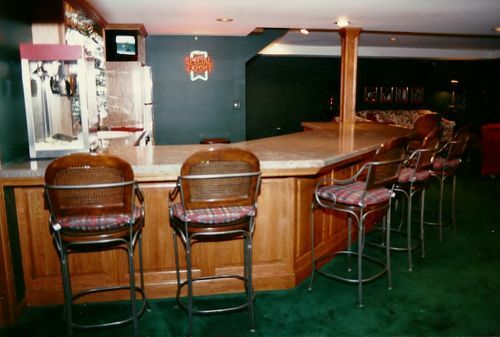 The other lady added a wet bar ….. more major plumbing and concrete work. She added a weight room and storage shelving and closet organizers,,... I hired another carpenter. She added a pool table bench/ book case cabinet with a fake lit octagon window,... so much for Sundays off. The other lady started complaining I wasn’t giving her my undivided attention! .... and added a full bath with a Jacuzzi. Man, I wish I had pictures of the other job, lost them in a camera that walked off the job or got lost, darn it. We finished both jobs in reasonable time and made the bridge club ladies of Armor Woods very happy. ......no mam, no… thank you. 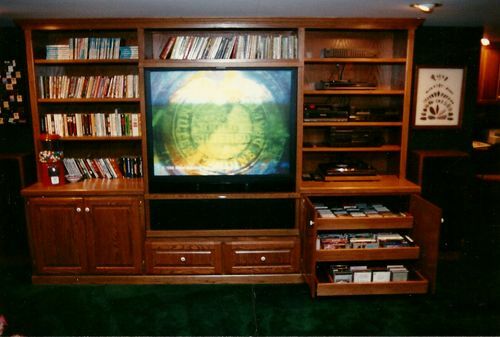 Basement remodeling jobs are a blast…. I’ve done so many I lost count. 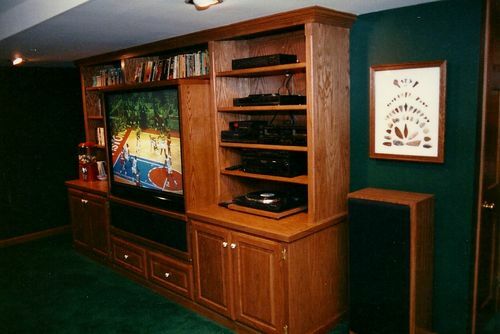 any basement jobs out there? You can post a picture here if want… show me your work! I’d like to see it. Home is the place that is being needed by many people who have some products. Moreover it is easy for us best dissertation that has a good habit for convincing others as well all the people.